The full development permit of the Metropolis Plaza project – a mixed-use lifestyle development located in the heart of Gzira, was approved by the Malta Environment and Planning Authority this morning. 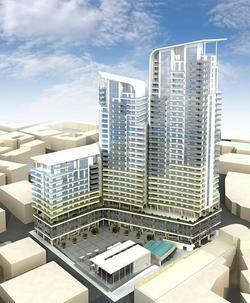 Metropolis Plaza is the tallest building currently being developed in Malta and will include residential, commercial, health, fitness and leisure facilities as well as extensive underground parking. The project’s developers are aiming to create a catalyst project for urban regeneration which would encourage further high-quality redevelopment in the area. “The Metropolis project will be injecting close to €60 million into the local economy, ranging from construction to finishing, consultancy and technical expertise. “The project will also contribute to generate and sustain substantial levels of employment. We are very satisfied that Mepa has brought the application consideration process to a positive end” said Joe R. Aquilina, chairman of Metropolis Developments Ltd. He said that the investment was directed to an area which was currently attracting several new investments. It was contributing in no small measure to the redevelopment and regeneration of Gzira and the surrounding areas, Mr Aquilina said.